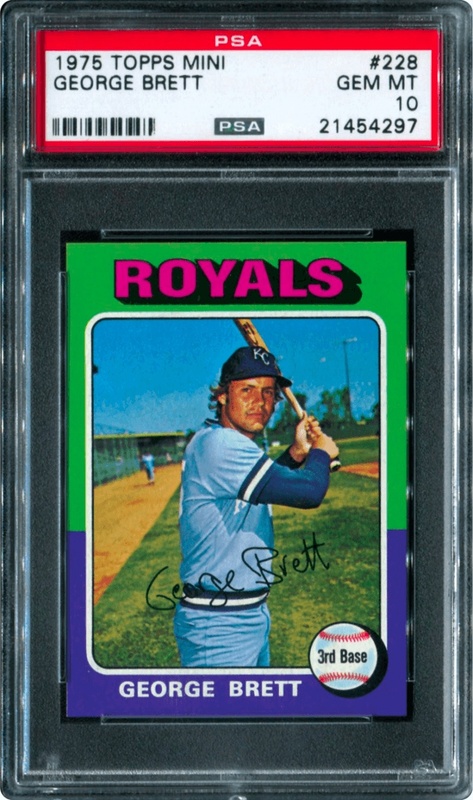 The 1975 Topps George Brett rookie card is one of the most sought after cards in the hobby. So is the nice pose of a young Brett wearing his Kansas City Royals cap standing ready at the bat. As a mid-70’s card, it’s on the latter side of the vintage baseball card spectrum. And while many cards from that decade may not fetch huge prices, Brett’s rookie card is an exception. The exact reasons why, we’ll get into shortly. It’s a card I’ve always wanted to own and someday hope to cross it off my want list in the near future. For now, I’ll go over everything you need to know about collecting Brett’s rookie cards. Along with the #223 Robin Yount rookie card, Brett's is considered to be a key to the set. And it's easily one of the most highly coveted baseball cards of the 1970's. Number: This is card #228 in a set of 660 cards. Design: The two years prior were thought to lack color so Topps packed a huge punch when it offered a dual-color border design with its 1975 set. Brett's rookie features green along the top border and purple along the bottom of the vertical layout. The Royals team name in pink at the top of the card rounds out this notoriously colorful design. As with many previous Topps designs, the 1975 set also featured a nice facsimile signature towards the bottom. Reverse Side: The reverse side of the card is printed vertically as well and contains his personal information and a brief list of stats. Both his Minor and Major League statistics are covered and Topps also talks about Brett being "one of the A.L. 's fine rookies of 1974" along the bottom. Topps also included a nice short trivia question about squeeze plays to help educate young kids on the lingo of the game. Condition Issues: The card can sometimes be off-centered but the colored borders offer the greatest challenge: chipping and wear along the edges and corners. While they make for a nice design, those colors don't do collectors any favors in trying to prevent wear from showing easily. The first thing people usually ask is: how much is a George Brett rookie card worth? If you find one in top shape then you're looking at a five figure price tag. The key is finding one graded by Professional Sports Authenticators (PSA) in PSA 10 Gem Mint condition. They are considered to be the benchmark in the vintage card industry so collectors put heavy premiums on their graded cards. The 1975 Topps design was actually shared by two other Brett rookie cards from the same year: the O-Pee-Chee and Topps Mini issues. The front and back imagery are the exact same across all three versions but there are some slight differences to be aware of. 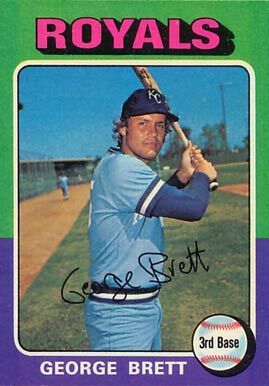 Distinction: O-Pee-Chee also released a George Brett rookie for the Canadian market in fewer quantities. Design: The imagery on the front side is the exact same as its Topps counterpart but the card stock itself was of lesser quality. It can therefore be a bit tougher to find in high grades. Reverse Side: The reverse side is almost the same as the Topps version except that the trivia question at the top and brief bio of Brett at the bottom have both been translated into French as well. The OPC print designation is also called out along the bottom of the card. Distinction: Topps released "Mini" versions of its regular line of baseball cards in the Michigan and West Coast markets in 1975. As you can see in the above comparison, they were smaller than the standard-sized issue and measured 2-1/4” by 3-1/8". Design and Reverse Side: Everything is the same as the regular Topps version except for the dimensions. George Brett goes down in history as one of the game's best hitters of all-time and arguably the best of his era. Elected to the MLB Hall of Fame in 1999. His 3,154 hits ranks 16th overall on the All-Time list and is tops among third basemen. To say Brett was an amazing hitter is an understatement. The guy could flat get the job done at the plate. And although he played in a smaller market in Kansas City, his play drove his popularity to extreme heights. To this day he remains a fan favorite and collectors throughout the hobby continue to chase down his rookie cards.